Craft beer and running are a great combination — as long as they’re not in that order. Despite the heat, I enjoyed the Inaugural 3rd Wave Brewing Co. 5K Run on Saturday, May 30, and the beer that came afterward. I originally signed up for the race thinking I would do it with some people from my work (I work at The Daily Times). That didn’t pan out, but I still had a lot of fun and a group of my friends also ran the race, so I got to hang out with them afterward. The race started and ended at 3rd Wave Brewing Company, which is on the Delaware side of the town of Delmar, but not too far from the line. The race went into Maryland, and it was my first time crossing a state line during a race — but not my first time crossing a state line during a run, as I did that during a run in Delmar last year. I know one of the owners of 3rd Wave Brewing Co., and I’d seen a Facebook post about growlers being prizes in the race, but I figured it was just for the overall winners and the first in each age group. Once I arrived at the race, I figured I wouldn’t win the age group, because I saw at least one person I knew was a lot faster than me. To my surprise, I ended up finishing third out of 11 runners in the female 19-29 age group, and I got to take home a growler with the race logo on it. Of course I paid to get it filled, as well — I didn’t want to take home an empty growler. 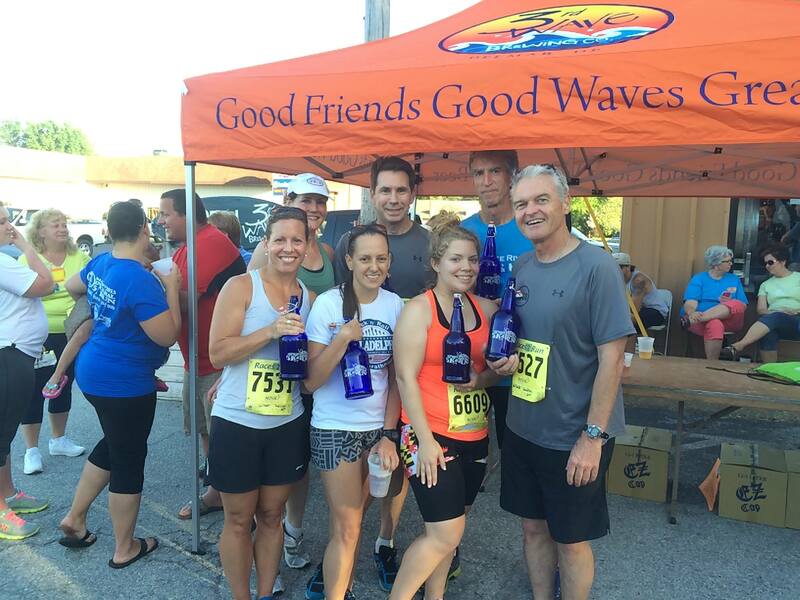 My friends and I pose with our winning growlers after the 3rd Wave Brewing Co. 5K. Someone at the race was able to take our photo. My friends and I did really well as far as age group places were concerned, with many of us taking home growlers. 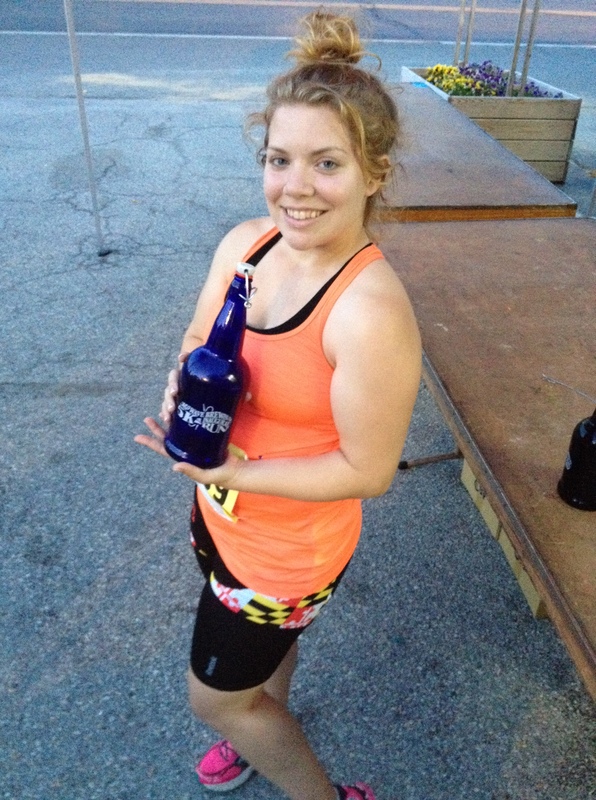 This was actually the second time I have won a growler during a race. The other time was at the Smile for Freedom 5K last year at Mispillion River Brewing Company. I’m a craft beer fan, and my boyfriend is a brewer. 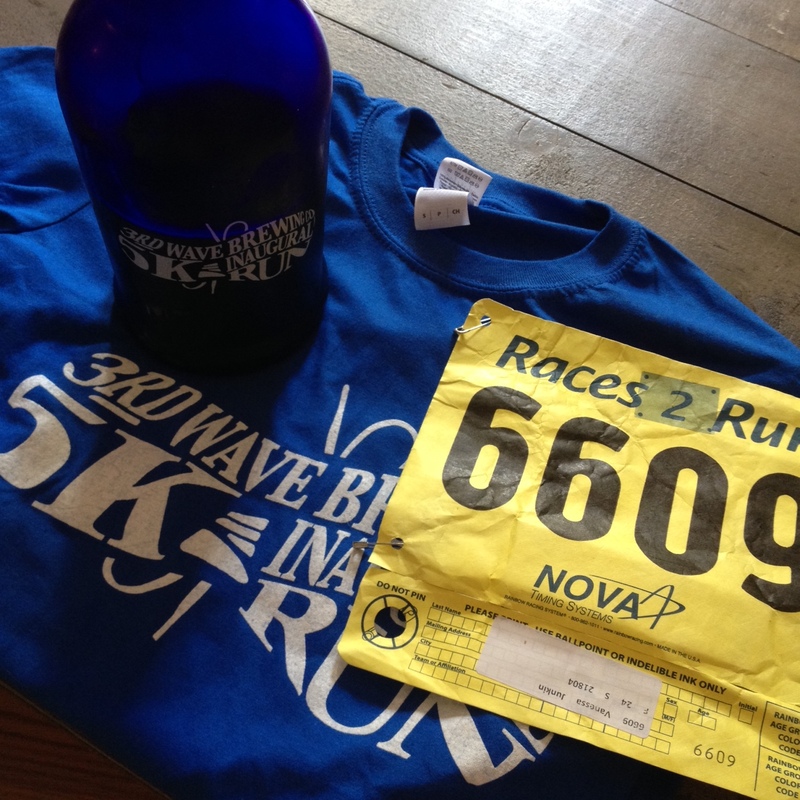 Registration to 3rd Wave’s race — which I paid the $20 pre-registration fee for — included two beer tickets, food, an after-party with live music after the race and a T-shirt. I was able to enjoy both beers, as a I got a ride home. I liked how one of the beers served, a white IPA, was called ‘Run Wit It’ to go along with the 5K. It was certainly a hot day, and if you’ve been following my blog posts since I started blogging on my old blog, you know that I don’t do well in the heat. Since dealing with dehydration twice, I have made it a priority to not end up in the hospital again due to a heat-related illness, even if that means a slower time or stopping to walk. I did stop to walk during Saturday’s race; I believe three times. A clock at the first mile marker read about 8:02 or so as I passed it, but I slowed down after that. My race chip time was 26:48, an 8:39 pace, according to the online results. On Saturday, I thought my chip time was 26:55 based on a printed out results list, but either way, it doesn’t change my placement in the age group. It was tough, and my shin also hurt a little bit at points — although that wasn’t as much of a problem for me as the heat — but once I saw that three-mile marker, I knew I was so close to the end, and gave it what I had. I saw I was going to be close to 27 minutes, so I tried to make it past the finish line under that, and I did. Friends were also encouraging during the run. That’s not an extremely fast 5K for me, but it is a pace of less than 9-minute miles, and I wasn’t expecting to break my personal record or anything. I figured it would be hot, and I just really haven’t been running that fast recently. I also haven’t been focusing too much on speed work, and haven’t been putting in as many miles since the marathon. And, it wouldn’t have been as fun if I had, for example, gone to the hospital, and hadn’t gotten to enjoy that beer and time with friends at the end!